Our Pathfinder Portfolio seeks to find the best near-term path forward by investing in areas of the financial market that will outperform others. Pathfinder is a momentum asset allocation methodology, also known as a trend-following or relative-strength methodology. Oftentimes particular types of investments will do well for prolonged periods of time. Our Pathfinder Portfolio attempts to take advantage of this momentum effect by identifying and investing in strongly-performing investments, and then shifting away when their performance fades to better opportunities. 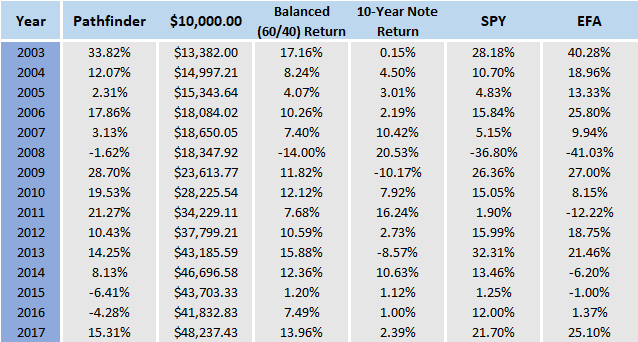 Among our strategies, this portfolio is the one most likely to give you regular exposure to the best performing parts of the financial market, while avoiding the worst. Our Pathfinder Portfolio may invest in U.S. or foreign stocks, different types of bonds, as well as real estate trusts and commodities. Our Pathfinder Portfolio invests exclusively in the strongest performing parts of its investment universe. Although this might produce broadly diversified holdings in stocks, bonds, real estate and commodities, it might also at times be invested entirely in stocks for example. Some investors may choose to emphasize our Pathfinder Portfolio or even exclusively use this strategy. But for most investors, who appreciate the benefits of our research-driven and broadly-diversified Alhambra Portfolio, we think this rules-based momentum strategy acts as an excellent complement. The Pathfinder rules-based process works by sorting the ETFs based on trailing three-month returns. 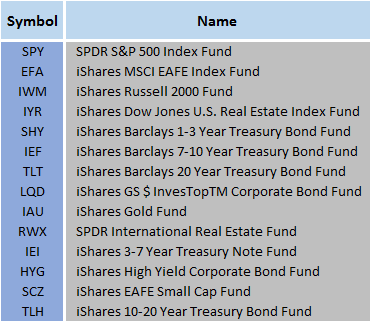 On a monthly basis, the four best-performing assets are bought and held for the following month. The Pathfinder algorithm may make changes as often as the start of every month, based on the most recent three-months of performance data. The oftentimes high turnover of this strategy is best suited for being employed in a tax-sheltered account, like an IRA. We also employ a risk hedge with this strategy. Risk control is based on holding cash if the price of an investment security falls below a 6-month moving average. Pathfinder Portfolios require a minimum of $55,000 and are usually included in accounts of over half a million dollars as about a ten percent allocation.  When used in conjunction with an Alhambra Portfolio, the impact of a Pathfinder Portfolio will often be to increase allocations to stock, commodity, bond, or real estate positions already held by the Alhambra Portfolio. The goal is to increase the performance of an overall strategy that remains broadly diversified.